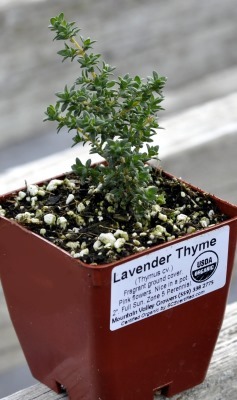 Lavender Thyme is a low growing thyme with very sturdy little leaves and stems. It's scent is a nice strong thyme with a hint of lavender thrown in, a very clean smell. Since it reaches about three inches and is not completely flat, It would make a nice rockery plant or filler where not too much walking is done. Its intense green color and mass of blooms definitely perks whatever it grows around. This plant is often available in plug trays. These trays hold 128 of all the same plant. They are a great low cost way to fill a lot of space. Each cell is 3/4 of inch by an inch. Check here to see if Lavender Thyme Plug Trays are available.